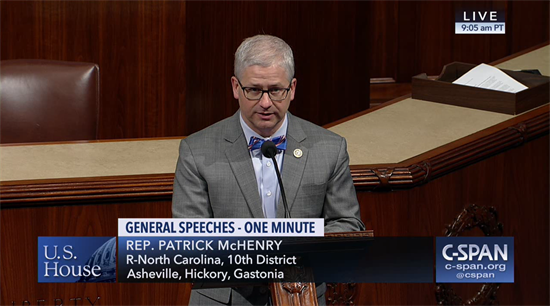 Yesterday, Chief Deputy Whip Patrick McHenry (NC-10) delivered a speech on the House floor renewing his call for the release of the wrongfully imprisoned Pastor Andrew Brunson. Pastor Brunson, who is originally from Black Mountain, North Carolina, has been imprisoned in Turkey since October 7, 2016. On March 13, 2018, Pastor Brunson was issued an indictment filled with bogus charges relating to terrorism and espionage and, if convicted, the Pastor could face up to 35 years in a Turkish prison. Click here or on the image below to watch Wednesday's speech. In May, a bipartisan group of 154 Congressmen, led by McHenry, sent a letter to the President of Turkey, Recep Tayyip Erdogan, urging the release of Pastor Brunson. You can read the letter sent to President Erdogan by clicking here.